You can't say enough about Peter S. Beagle. One of the great masters of modern fantasy, author of THE LAST UNICORN, A FINE AND PRIVATE PLACE, LILA THE WEREWOLF, GIANT BONES, I SEE BY MY OUTFIT, and so much more... classic novels, moving novellas, terrific short stories... and he's just as wonderful a storyteller in person as he is on the page. We were honored to have him as our guest at the Jean Cocteau Cinema last Saturday. 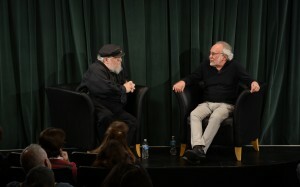 We screened the animated film of THE LAST UNICORN thrice to big crowds, and Peter and I talked about fantasy, his books, his film career, and his life for the better part of an hour. 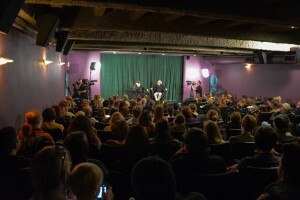 After each screening, Peter signed books, comics, artwork, and merchandise for his fans. The man is tireless... and always charming. A delight all around. I suspect he signed his name hundreds, maybe thousands, of times on Saturday... but before we let him go, we made him sign a few more items for the cinema. So we do have some autographed Peter S. Beagle books available at the Jean Cocteau for those who missed the event... while the supply lasts. It won't last for long. (We also have lots of signed books by yours truly, a few by Neil Gaiman, Michael Chabon, and Pat Conroy as well). Beagle is a real rock star of fantasy, and he tours like one. The day before he brought his travelling LAST UNICORN tour to Santa Fe, he was in Tucson... and as soon as he was done, he and Freff and Cat and the rest of his faithful minions packed up their vans and hit the road for Fort Collins, Colorado. Check out the tour details at http://www.conlanpress.com/ and find out when Peter and Schmendrick and the Red Bull are coming to your corner of the lilac woods. ~when I have more than enough to spare, I might just drop a line or two when the time comes..otherwise, taking notes of those books. I saw him in Pittsburgh on a freezing night last winter. The heat in the theater went out, but we all sat there in our coats and scarves to listen to Mr. Beagle's stories and watch the movie. He was awesome to make the best of it and answer questions, even though it was so cold. Afterwards he signed and signed. Great writer and a stand up guy.